Who is Brain Gym® in South Africa? Brain Gym in South Africa is a non-profit umbrella organisation. Recognised and accredited individual Brain Gym practitioners and trainers are members of this association and individually they work for profit to benefit individuals, businesses, children with learning disabilities and the community. This is similar to other professionals belonging to umbrella organisations when they qualify such as doctors belonging to medical councils and engineers belonging to engineering councils. Through such organisations you can check and verify the qualifications of your practitioner to ensure a quality service as well as find qualified professionals in your area that can help you. Brain Gym in South Africa in affiliated with Brain Gym International. Our courses are internationally recognised and accredited. This means that if you move to a new country, the qualifications obtained through Brain Gym in South Africa remain valid. We encourage you to contact practitioners in your area directly, rather than to contact our organisation directly. Please refer to the available courses and practitioners to find a professional close to you. The Brain Gym program promotes a series of exercises to improve academic performance, lower anxiety levels and help individuals to de-stress. 26 Brain Gym activities improve eye teaming (binocular vision), spatial and listening skills, hand–eye coordination, and whole-body flexibility, and by doing this manipulate the brain, improving learning and recall of information. Numerous books have been written describing research and case studies in which use of the Brain Gym activities benefited specific populations, including children recovering from burn injuries and those diagnosed with autism, ADD, ADHD and dyslexia. The Brain Gym activities have been incorporated into many educational, sports, business, and seniors programs throughout the world. They are also widely used in British state schools. 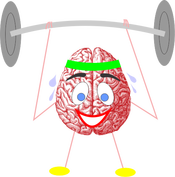 What can Edu-K (Brain Gym® Balancing) and Brain Gym® do for individuals, our community & society? The diagram below is an illustration of how we change our society, by changing the individuals. As people get the opportunity to build self-esteem and unlock their potential, they share and help each other more. They uplift the people around them and thus affect their community. The more communities are affected, the more they influence society. In other words: the more people use Edu-K and Brain Gym ® the greater the positive influence on our society will be. You can use Edu-K and Brain Gym ® by either coming for an individual consultation or enter the learning track and learn to apply these powerful techniques yourself. If you want to come for consultations, go to the practitioners list and find a person in your area. If you want to learn Brain Gym ® and Edu-K then find a trainer in your area from the trainer's list.